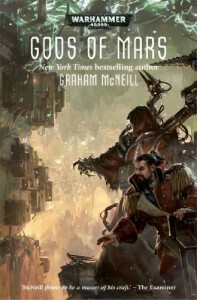 This is the third volume of Graham McNeill’s Adeptus Mechanicus trilogy and also one of the more complicated and sort of all encompassing WH40K novels I've read. Of note is how most of the plot takes place out of the reach of the Emperor and his perpetual Astronomicon beacon, thus making it kind of a rogue novel in this WH40K galaxy. Many WH40K characters are involved in the battle to stop the long lost Telok from executing his plan of destroying Mars and ultimately the Emperor. The highlight of the book to me was the various protagonist groups battling the evil spawned Tindalosi. Reading this you could sense that many of the good characters in the book were about to perish. This was my first deeper exposure to the Eldar also, and I found them very mysterious and interesting characters. I also got my first real exposure to the Cadian shock troops, very interesting as well. I am not rating this one as high as past WH40K efforts, due to how (unnecessarily) complex the novel was. It just didn't flow as well, but it was very enjoyable to read and dissect.